Community Q&A sections are becoming a common feature on ecommerce website to help drive conversions. Here's how to get started with Q&As for your ecommerce business. This is a goldmine for driving conversions because customers will learn even more about the potential products they want to buy. Instead of having to go to another website or YouTube to learn more about your products, they can stay on the same page and get all the information they need. Today, many ecommerce sites use the same concepts and features, which is a direct result of years of consumer data. It’s the same reason why leading smartphones look incredibly similar to one another. High-performing ecommerce sites include things like social sharing, reviews, basic product descriptions, and high-quality photos. On top of these features, there are also a few unique components like the homepage and narratives about the brand. This familiarity helps build consumer confidence, especially if a consumer is unfamiliar with a brand, and in turn, leads to higher conversion rates. The point being is that if there are clear indicators that other people have purchased an item, other consumers will have enough confidence in the brand to make a purchase. While reviews are great and necessary, there are other key features that embrace user generated content such as feedback or question and answer sections. Feedback sections empower your customers to provide additional details about a product or service that may not have included in the description. When in doubt, just look at what Amazon does. 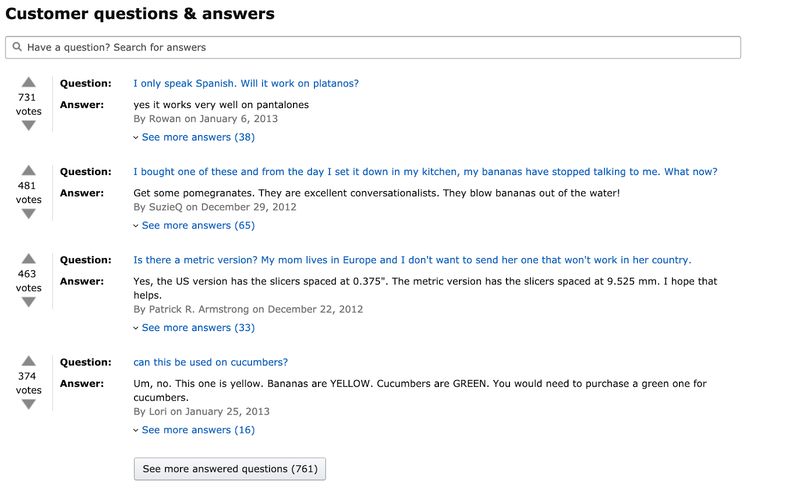 On each product page, just above the reviews area, is a question and answers field which list common questions. Not only does Amazon use a question and answer field, but they can also be found on the likes of Sephora, Best Buy, Lowes, and even My Pet Chicken, a site where you can purchase chickens. B2B ecommerce sites tend to also be a fan of this particular feature as their customers often require more insight into their products than a traditional consumer. On each of these examples, customers can be seen diving in deeper into the product listed, which shows both knowledge of the product and builds trust that someone else has purchased it. The Q&A content can even be shared through social media. According to Okendo, this feature ensures customers have access to the most accurate and comprehensive information available. Stamped.io also shows how this content can provide SEO value too. One of the biggest challenges a brand will face when first adopting a customer feedback section is the initial content. Just like reviews, you’ll need to encourage people to answer questions to make it a useful resource. This one is pretty self-explanatory and is something even Amazon does. After a person has made a purchase, you can prompt them to answer specific questions that another user asks. You can even pre-seed basic questions to get the ball rolling. The story you convey about each product is more important than this particular section. It allows you to control the message better and highlight the key components of a product. Users expect this flow, and if they have more questions, they will often poke around in the review section for answers. By deprioritizing the feedback area, but placing it above reviews, it’ll provide the best value for the goal. Like reviews, legitimacy plays a key role in what information is provided. By only allowing customers who purchased a specific product to answer questions, you can ensure that they are more suited to providing insight on them. Customers are more engaged on mobile now than they are through email. With the rise of ecommerce messaging apps, customers are actually having conversations with their favorite brands. With high open rates and engagement rates, you can ask for customers to create Q&A content after they receive their product. With customer Q&A sections, ecommerce businesses have a great way to get user-generated content. Building a community where customers can interact with each other to answer questions about products helps your ecommerce site keep a customer’s attention (and the SEO boost is always nice too). Elliot Volkman is an award-winning journalist with a background in ecommerce, cybersecurity, and startups. You can often find him running marathons around the states.